Technology, particularly a technology as ubiquitous as the internet has become, has a tendency to engender fear in those who see its potential for misuse. That fear, in turn, is often channeled into works of art, including, of course, the movies. That's certainly been borne out by the volume of internet-inspired horror films and cautionary tales, among them DISCONNECT, UNFRIENDED, THE DEN, and FEARDOTCOM. Only time will tell whether these films turn out to be prescient or quaintly laughable. In the meantime, director/co-writer Adam Randall gives us another film reflecting the anxieties of our modern age in LEVEL UP. The plot revolves around British slacker Matt (Josh Bowman), who spends most of his day drinking, watching Youtube videos, and playing video games. Matt is suddenly forced to take a more active role in the world when he is kidnapped by a group of guys in ski masks who strap a vest on him containing some unknown but evidently important item. He must deliver this item to parties unknown within a particular span of time, or else his girlfriend Anna (Leila Mimmack) will be killed. Complicating matters is a middle aged gentleman (William Houston) who is fiercely determined to get the package for himself. There are twists and turns, chases and fights, and at times both Matt and the audience question the reality of the situation. Oddly, however, the film fails to generate much in the way of suspense or tension. Part of that is due to the character of Matt, who makes for a painfully dull protagonist, and part of that is due to Randall's flat direction. The throbbing electronic soundtrack by Plaid injects some excitement into the proceedings, but music can only do so much. Eventually the film culminates in a painfully on-the-nose final scene asserting that we've all become soulless and desensitized by our modern connected world. 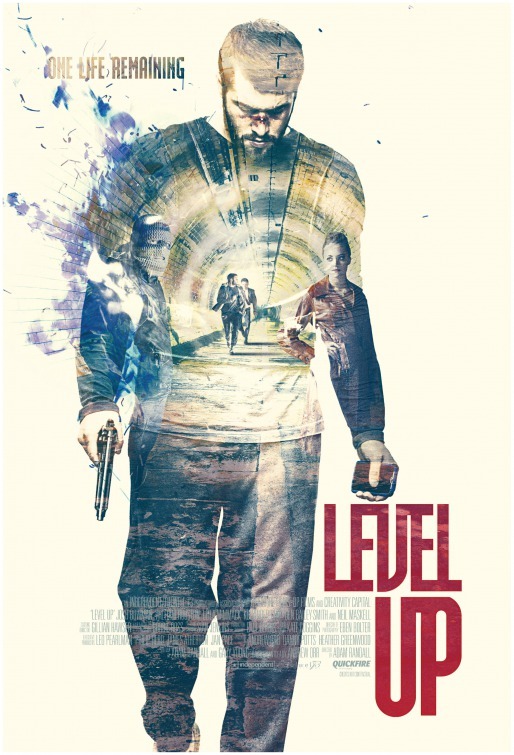 Such a point of view, whether one agrees with it or not, can certainly be made effectively by a film, but LEVEL UP fails to do so. 2 out of 4 stars.